Railpictures.ca - Robert Farkas Photo: I believe it was the first Saturday in June 1970 when fellow railfan John Woodworth and I crossed into Sarnia only a few minutes prior to CN 6218′s leaving on an eastbound excursion. The early morning was cloudy with a slight trace of fog. We found her by an unknown park where I believe the boarding was taking place Here is CN 6218 just a few minutes before its departure. At the far left is a photographer taking a photo of the child with 6218 in the background. | Railpictures.ca – Canadian Railway Photography – photographie ferroviaire Canadienne. Caption: I believe it was the first Saturday in June 1970 when fellow railfan John Woodworth and I crossed into Sarnia only a few minutes prior to CN 6218's leaving on an eastbound excursion. The early morning was cloudy with a slight trace of fog. We found her by an unknown park where I believe the boarding was taking place Here is CN 6218 just a few minutes before its departure. 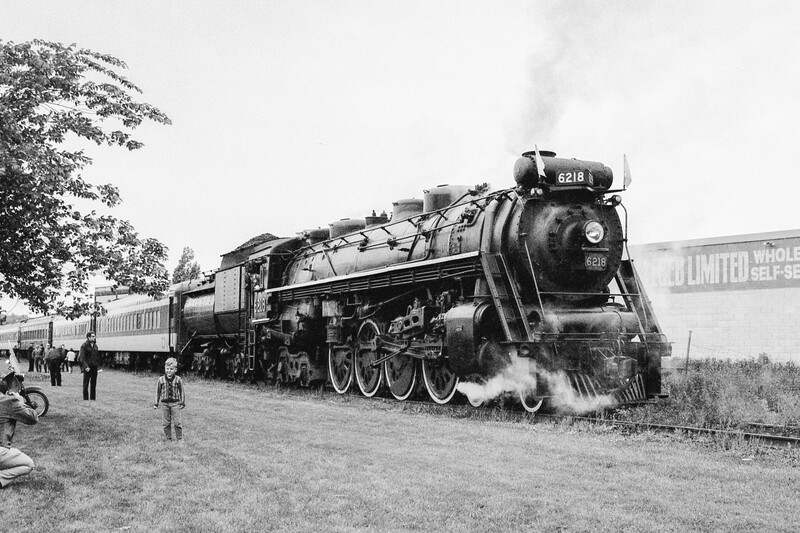 At the far left is a photographer taking a photo of the child with 6218 in the background. Can you imagine a time when scores of these beautiful locomotives scoured the CNR, coast to coast? Happy National Birthday, my Canadian friends! Wow. This is a really classic shot. Well done.